I think we need to be careful about that. Spoilers ruined the last two seasons of Buffy for a lot of people. Joss himself says that he loathes spoilers. It takes away the punch, you know? I think we as a community should try to stay away from spoilers and just read the comics as they come. yea but i'm talking minor spoilers, just you know, sneak peeks to the future plot - not something like "warren-shoots-tara". how about mentioning who's actually coming back, among the characters of both BTVS and ATS? report the actual situation of the buffyverse (comics, books, magazines - what's gone for good and what's coming up) and have a brief QeA with the fans - the buffyverse fandom has always been big on this last one, you know, being in constant touch with fans, which is what helped keeping it alive. i think a little panel at san diego wouldn't be bad. I wish we could get a panel together! That would be really cool! The covers are great. I can't wait until this comes out. Season 8 is wonderful!! san diego comic con announced that jw will be present and discuss serenity special edition but most of all buffy tVS season 8! I'm so gonna be there! If they allow videos, I will take one of his panel!! Yay! I love the borders! Thanks! It's weird not seeing Georges Jeanty's name. Yes! Almost as weird as the pink barcode. OMG at TFAW it says that 'the chain' will be available on july 25th!!! Could this be an error or have they actually decided to release the issue early?!?!?! I don't believe Joss wants there to be a preview for this ish as he has already said he doesn't like spoilers and also the fact that this ish is special to him. Maybe he wants this to be a huge surprise!!! Good theory. But it still puts a damper on those expecting a preview. Have you checked at DarkHorse for the date? They may have changed it there too. It's looking good for an early release. Forbidden Planet says it's releasing on the 26th (we get it a day later here in the UK). 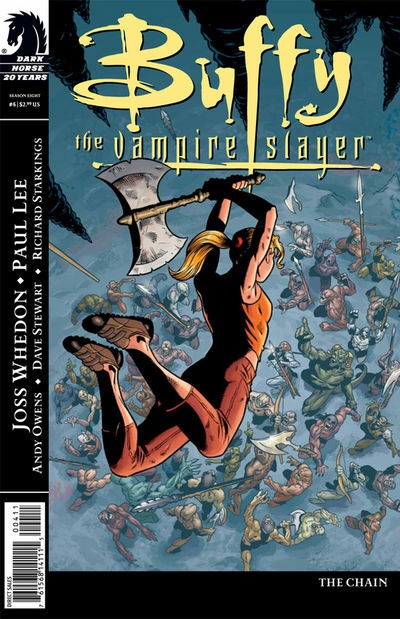 OMG, i typed in 'buffy #5, july 25th' and on the livejournal site, it says that 'buffy #5 has been moved from aug 1st to july 25th'....Holy crap!!! Plz be true... i sent an email to scott allie asking whether this is true and why we haven't had any real confirmation as of yet!!! OMG!!! I'm so phyced... I guess Dark Horse decided to stop the torture and the pain!!! Plus, at least we don't have to wait 2 months for issue 6, just 1 month 10 days which i'm sure i can handle... This had better be true because if I go into my comic store and ask, i'm just gonna look like a fool, if they don't have it in and will have to buy more comics which is a bad as i'm not exactly basking in the money!!! I just came from TFAW and saw it's coming out next week, but I guess you guys already know that. Hehe. Way cool! This is great! Just in time for SDCC! 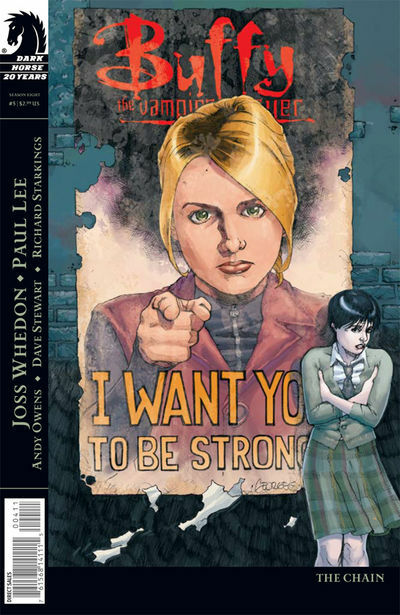 I'm gonna have mine signed by Joss! !